I think you’d be hard pressed to find a city that’s better at making someone feel at home than Chicago. I first ventured to the “Windy City” as a kid in the 1980s, and, truth be told, it was the first really big city I had ever seen. I was blown away. I went back every few years for one reason or another, but for the last ten years, I’ve gone back for work, and part of my job was to be a tour guide. 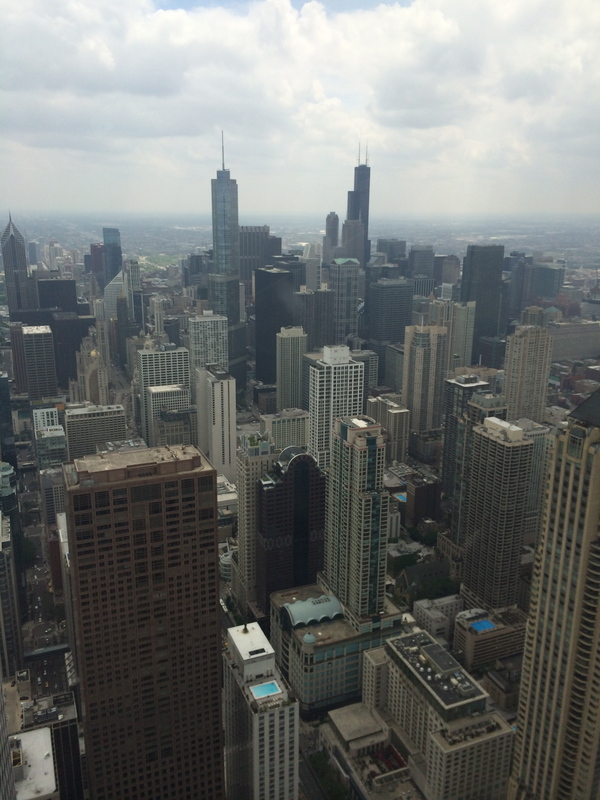 I fell in love with Chicago. From its architecture to its people, there’s a world to explore in the city, but in the event that your time is limited, it’s my pleasure to provide you with this handy guide for four days in Chicago. There’s no easy way to put this, but this will be the hardest day of your time in Chicago. Fear not, though! The bad stuff won’t last too long. What is this bad stuff, you’re wondering? It’s traffic-Chicago’s bane of existence. It doesn’t matter how you come into the city. Traffic is terrible. Flying into Midway Airport? Traffic into downtown is terrible. Driving into the city? Get ready for terrible traffic delays in bumper to bumper traffic. Flying into O’Hare International Airport? I will shed a tear for you. There is a solution, though. Chicago has done a fairly good job of developing its public train system. Use it. It can get you around the city quickly and efficiently, although maybe not to the points you might want to visit. It can, at least get you into the neighborhood, and often far faster than if you were to travel by car. Judging transportation time in Chicago can be extraordinarily difficult. If you have some free time in the afternoon or evening, spend it walking around your neighborhood. Rest up and prepare for the next few days. Adventures await! Wear comfortable shoes because there’s a lot to do today, and you’re going to be clocking some mileage. Start your day at Union Station. It’s by the Chicago River and across from Willis Tower (aka the former Sears Tower). As you look up and down the river, take a moment to consider why Chicago is known as the “Second City.” It isn’t because it’s “second” to another American city, but rather because of the great Chicago fire of 1871. Much of the city was destroyed, as legend has it, due to a cow kicking over a lantern. The truth is that, although it did start in a barn, a reporter freely admitted that he embellished the cow’s contribution. Regardless, a strip of the city, six miles long and three-fourths wide was destroyed. Today, fittingly, the point where the fire began is the Chicago Fire Academy. The City of Chicago rebuilt itself, bigger, and more modern than what had existed before. For this reason, it earned the nickname of the “Second City.” As the city rebuilt itself, it incorporated the latest in turn of the century architecture, building on steel frames and using elaborate brickwork. The results today are a combination of old and new, historic and modern. As you stand outside of Union Station, you’re seeing “the new.” Much of this area of the city was built in the latter half of the Twentieth Century. For most of it’s life the Willis Tower was considered the tallest building in the world, and although that honor is now rivaled by others, it is no less an impressive site. The Tower does have an observation floor that is open to the public, but I’d suggest you skip it. It’s expensive, and can be crowded at times. Don’t worry, you’ll have the opportunity to do something similar, a little later in your trip. From the tower, cross over the river and begin walking toward the Great Lake. This is the heart of the business district of Chicago. Banks, high end retailers, and several well-known restaurants and bars and nestled along this route. The famous Berghoff Restaurant and Bar is in this neighborhood. 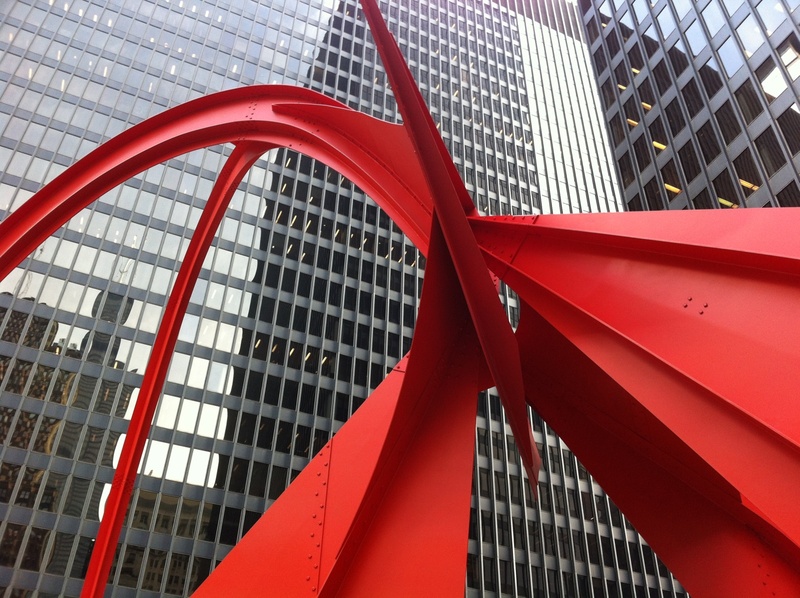 So, too, is Calder’s Flamingo, the iconic modern steel statute seen in movies of all sort, from “The Blues Brothers,” to “The Lake House.” Not too far away is Lou Mitchell’s, a diner with the peculiar habit of giving women and small children a small box of milk duds when they are seated. The pancakes here can’t be missed. 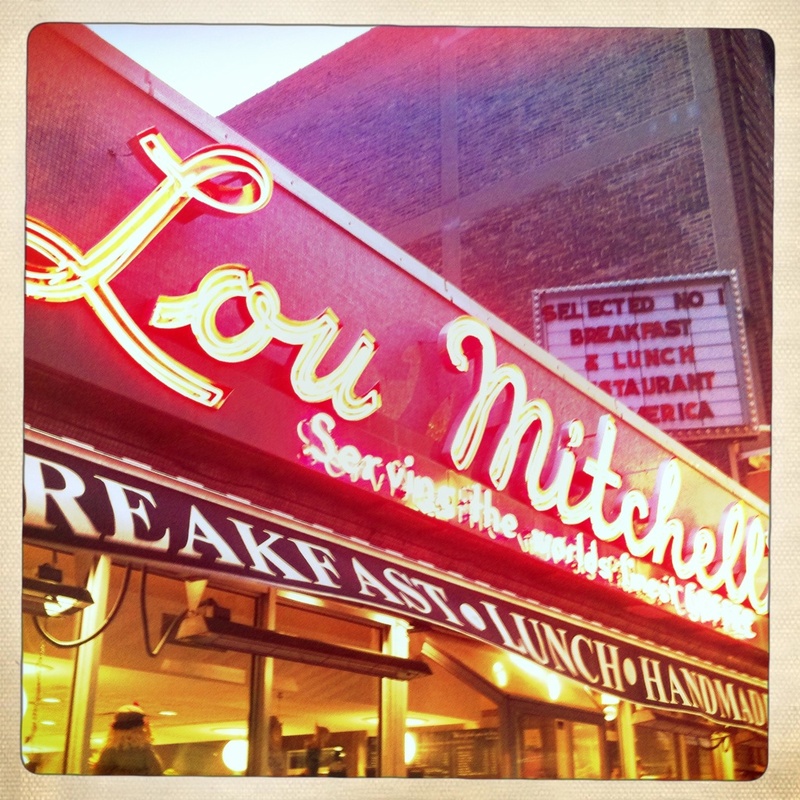 If you are starting out in the morning, start your day with breakfast from Lou Mitchell’s. I was taught to do my homework before I went out to play, so I always advocate in favor of doing the “educational stuff” on any trip first. Now that you’re charged up from a hearty breakfast, walk over to the Art Institute of Chicago. Pose for photos with the famous lion statutes on the steps and then go inside for a truly amazing collection. Monet, Picasso, Hopper, Renoir, Van Gogh, O’Keeffe – they’re all showcased inside. There’s also a fantastic collection of midcentury furniture, ancient artifacts, Renaissance art, and even American folk art. It is well worth a few hours of your time to wander through its galleries. If you have young children, do not miss going into the basement. There you’ll find a fascinating collection by a woman with an odd hobby. She created representative miniatures in startling detail of various types of American homes. Kids (and adults) will be fascinated. Once you’re back on the street, head right along Michigan Avenue and make your way to Millennium Park. It’s a large green space between the city and the lake, and has become the jewel of the city. You’ll find the Cloud Gate (aka “The Bean,” as it has become known), an ice skating ring, an amphitheater, water fountains that you can splash in if you need to cool off, and a couple of really fun (and maybe a little disturbing) art installations of faces. Cross back through this and over the abstractly shaped stainless steel bridge to a massive children’s play area. If you have kids, let them run around a bit, or keep moving on down towards the lake. Once you’ve reached the lake, go right and begin walking along the river and you’ll come to another park, and in the center of it is Buckingham Fountain. It’s one of the landmarks of the city and makes for phenomenal photos with the city’s skyline in the background. Take a crosswalk, and cross the road, to the lake’s edge. 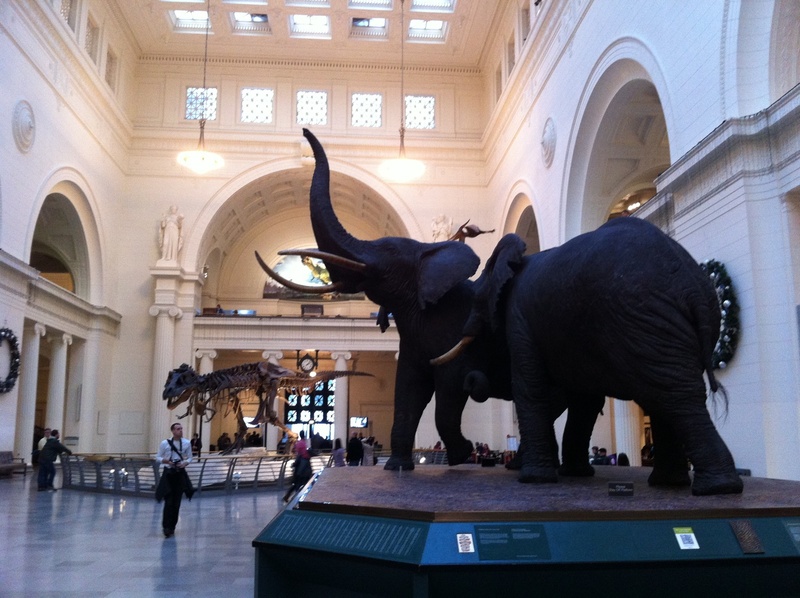 Continue strolling and make your way to the “Museum Campus.” Here you’ll find three legendary museums: The Field Museum of Natural History, Adler Planetarium, and Shedd Aquarium. You could spend a day (and a lot of money at each of these), but if you’re time is limited go to the Field Museum. Some of the exhibit halls are actually free. This area is also a terrific point for photographers that want a picturesque view of the city and the lake. It’s especially nice at sunset. If you haven’t nerded out enough at this point, take a cab, Uber, or the bus to the Chicago Science Museum. It has a variety of exhibits that make an exploration enjoyable. A full scale submarine is on display. There’s a children’s hands on museum, and a host of other halls that focus on a variety of science based concepts. At this point you’re probably going to be hungry and wanting to take it easy. 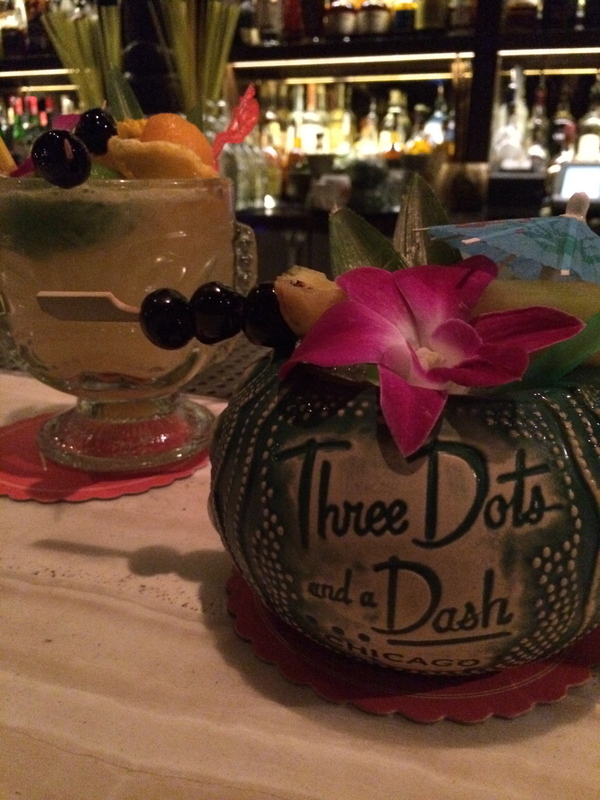 A great place to do just that is to have a drink at Three Dots and a Dash, a modernized reimagining of an old school Tiki bar. The staff wear Hawaiian shirts and the drink are served with umbrellas, but they’re just part of its charm. It’s actually tucked away in the basement under a burger and steak joint, but walk around the block and into the alley. You’ll see the torches. Once you’ve recovered from the day, head back to the street and duck into one of the neighboring indie restaurants. From guacamole black bean burgers, to quinoa tacos, to much more high end faire, you’ll be hard pressed to go wrong at any of the restaurants in the area. The hard part is over and today moves at a much more relaxed pace. Why not take the train over to Boystown and go for a stroll, and then walk over to Wrigley Field. If you’re a baseball enthusiast, take a tour of the historic stadium. The neighborhood around the stadium is very different from downtown. It’s more residential, and a bit more blue collared. If lunch hits, and you’re feeling brave you can visit the Weiner’s Circle. It has the best hotdogs and the best insults in the city. Here’s a hint, though, if it’s busy, know what you want before you get to the window, or else you deserve everything that’s about to come your way. For an idea of what I’m talking about, watch this….. If you need something a bit more inspiring, take a walking tour of the architecture of the city. The Chicago Architecture foundation offers boat tours and walking tours, so that you can learn more about the city’s history and architectural importance. Chicago is a foodie’s dream come true, where amazing options abound, but on my recent trip I was directed to Bar Takito. 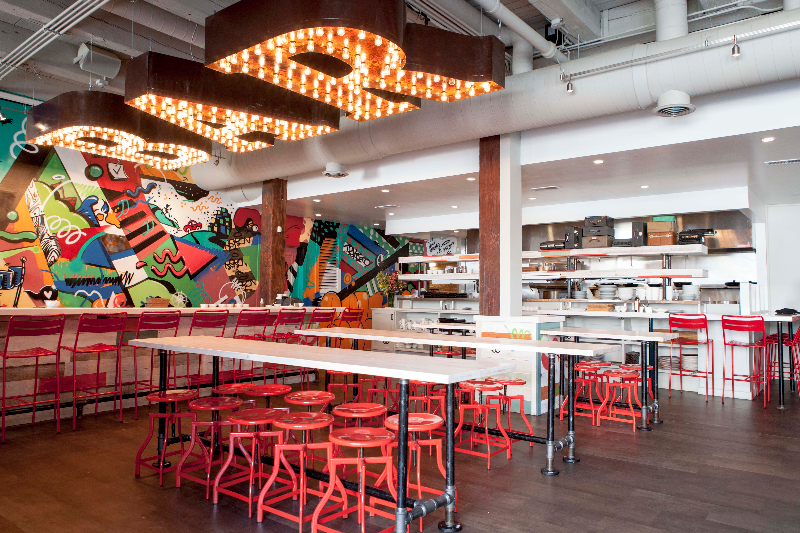 Located in the West Loop, it’s a casual mix of reinvented tacos, seafood, and other seasonal deliciousness. It’s funky interior, great music, and food really makes this one of the new restaurants in the city to try. It’s also located by a stop on the mass transit system, the “L,” so it’s a breeze to find. It’s your last day, and it’s time to leave your mark in Chicago. The best way to do that is to hit “The Magnificent Mile,” the city’s upscale shopping neighborhood. If you can think of the brand, there’s probably a store for it here. All the brands and stores are here, from tourist traps to high end retailers and department stores. Along the way, you’ll also see the Tribune Broadcasting headquarters, home to The Chicago Tribune, Tribune Media, and WGN Radio. Further up, you’ll come across the Water Tower, one of the original water pumps for the city. Today, it’s an art gallery. Take a break and walk two blocks off of Michigan to experience the wonder that Chicago deep dish pizza at Giordano’s. Their lunch specials are worth going a little out of your way for. At the end of the shopping district you’ll see Hancock Tower. If you’re looking to see the city from an entirely different perspective, buy a ticket and take the elevator up to the observation floor. Tickets are cheaper than Willis Tower, the observation floor is almost as high, and you can walk outside into a screen in area, which you can’t do at Willis! Tucked away, almost under Michigan Avenue, is a little bar known as “Billy’s Goat Tavern.” It’s the inspiration behind one of “Saturday Night Lives’ earliest successful sketches, “The Olympia Restaurant.” Patrons of the fictionalized restaurant can only order cheeseburgers and Pepsi, and the ordering method is….unique. In real life there isn’t much more on the menu, and there’s still some shouting that goes on, but it’s definitely easy to see where the inspiration came from. There’s so much more to see and do in the city. Checkout one of the legendary popcorn or nuts venders, such as “Nuts on Clark.” Head out to a blues club, such as Buddy Guy’s Legends, or Kingston Mines. You could even spend the day free of an itinerary, and see where it takes you. 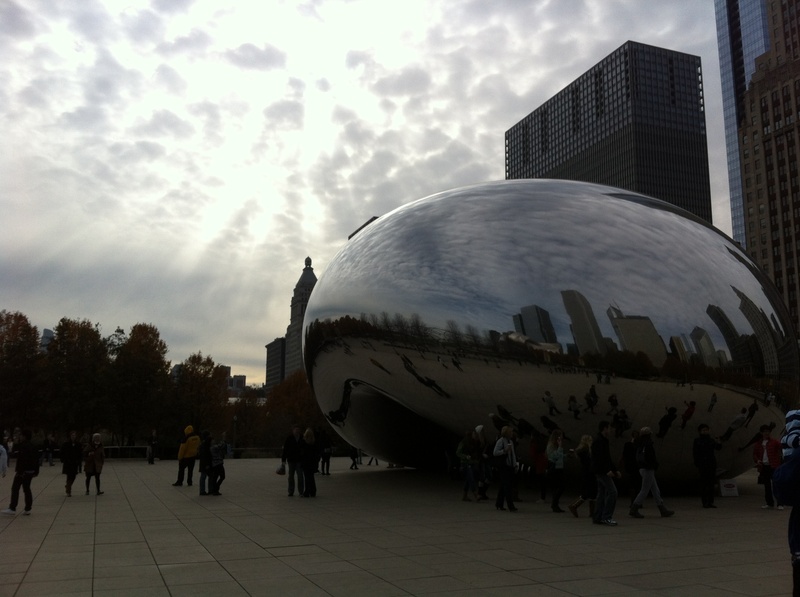 Either way, Chicago is a city worth visiting and worth knowing well. For even more information, visit www.choosechicago.com. 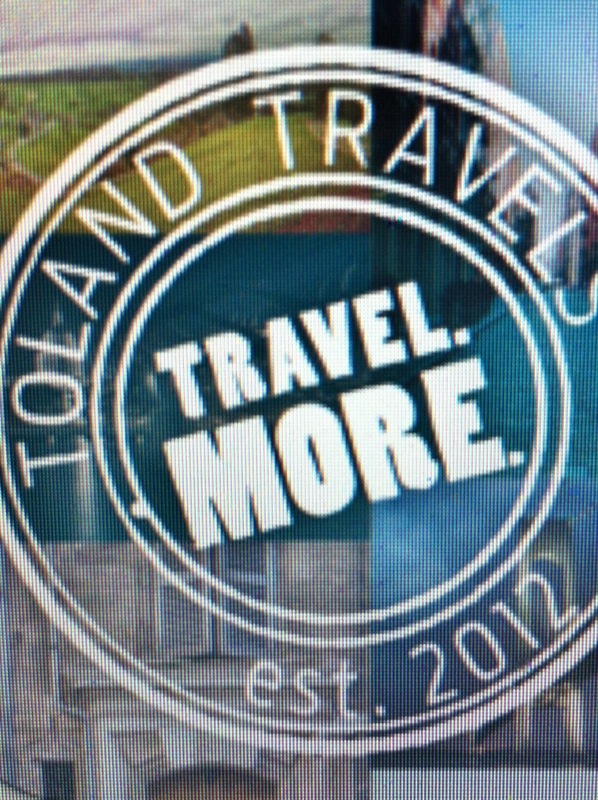 Download the Toland Travels App from iTunes.